Yossi Milo Gallery is pleased to announce Appalachian Lives, an exhibition of new black-and-white photographs by Shelby Lee Adams. The exhibition opens on Thursday, September 4 and closes on Saturday, October 11 with a reception for the artist on Thursday, September 4 from 6:00-8:30 p.m.
For almost three decades, Shelby Lee Adams has been photographing friends and relatives in the Appalachian Mountains of eastern Kentucky, including Perry County (where the artist was born) and Letcher County (where the artist grew up). The photographs in Appalachian Lives are part of a series that the artist began in 1973, but the images in this exhibition focus on present day Appalachia, a region that “progress” has placed under siege. Adams finds that his subjects are less likely to live off the land and more likely to embrace the media culture, as reflected in the fancier dress that his subjects choose, the mobile homes that appear with increasing frequency, or the satellite dishes that dot the landscape. Adams is not a documentary photographer, and he does not attempt to be objective when he photographs his subjects — all of whom are friends and some of whom are relatives — year after year. 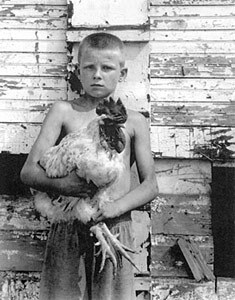 The artist spends two or three months each summer in eastern Kentucky visiting with people and taking photographs. A visit might last for several hours, and the artist usually enters the home with several pieces of equipment (e.g., four-by-five view camera, tripod, assorted lenses, as many as five light sources, umbrellas, light stands, meter, and yards of electrical cord). The result is an elaborately staged image that is a collaboration with Adams' subjects, many of whom the artist has visited and photographed frequently over the years. Adams' work has been published widely, his third and most recent book, Appalachian Lives, was released in June of 2003 and includes many works which are being exhibited for the first time in this exhibition. Appalachian Lives (2003) as well as Adams' previous two books Appalachian Portraits (1993) and Appalachian Legacy (1998) are all published by the University Press of Mississippi. A documentary film about the photographer and his work was released in the fall of 2002, and was well received at the Sundance Film Festival and the Toronto Film Festival. Shelby Lee Adams has had solo exhibitions at the International Center of Photography in New York, Cleveland Museum of Art, Fogg Museum at Harvard University, and Musee de l'Elysee in Lausanne, Switzerland. From 1998-2001, his exhibition Shelby Lee Adams, Appalachian Portraits traveled from Switzerland to museums in France, Spain, and Finland. Adams' photographs appear in the permanent collections of several museums, including the Museum of Modern Art in New York, Art Institute of Chicago, Los Angeles County Museum of Art, San Francisco Museum of Modern Art, Dallas Museum of Art, Museum of Fine Arts in Houston, Cincinnati Art Museum, Stedelijk Museum in Amsterdam, National Gallery of Canada in Ottawa, Corcoran Gallery of Art, and the Smithsonian's National Museum of American Art in Washington.